One week ago today, Deputy Attorney General Rod J. Rosenstein was on his way to the White House to present his resignation to President Trump. The second-in-command of the Justice Department was expecting to be fired after a New York Times report on September 21st said that Rosenstein had considered secretly taping the president and had discussed using the 25th Amendment to remove him from office. The New York Times heard of this shocking development through former FBI Director Andrew McCabe’s memos, which recounted a conversation between himself and the deputy attorney general on this matter. Rosenstein plays a controversial role in the Trump Administration. In addition to being responsible for legal operations for the current White House, he serves as the creator and overseer of the Russian Investigation (also referred to as the Special Counsel Investigation, Mueller Probe, Russia Inquiry, etc.). Former FBI Director Robert Mueller, appointed as special counsel by the deputy attorney general, would go on to lead an ongoing law enforcement and counterintelligence investigation of any Russian government efforts to interfere in the 2016 presidential election. The scope of this inquiry would also include potential collusion or obstruction of justice by President Trump and others in his administration. Political partisanship has reached new levels since the Special Counsel Investigation begun on May 17, 2017, so it is important to look back to that newsworthy, yet volatile time in the spring of 2017. Attorney General Jeff Sessions’ meetings with the Russian Ambassador, Sergei Kislyak, during the campaign, and the sweeping fallout once they became publicly disclosed, ultimately resulted in his recusal from supervising the Russian Investigation. This was discovered on March 1, 2017, which only continued the seemingly endless stream of headlines and commentary on the White House. On April 6th, House Intelligence Committee Chairman Devin Nunes recused himself from the Russia investigation and was replaced by Mike Conaway, a committee which issued a final report on the Russian Interference in which he exonerated President Trump and his associates from any wrongdoing, or that Moscow even attempted to elevate him to the presidency in the first place. The entirety of the U.S. Intelligence Community and the Senate Intelligence Committee have contrarily concluded that the Russian government did in fact support Donald Trump while working against Hillary Clinton. It was this fundamental disagreement, and prior noteworthy developments in the coming weeks, that resulted in the opening of the Special Counsel Investigation. So far, the Special Counsel Investigation has resulted in dozens of indictments for federal crimes, and at least eight guilty pleas or convictions. These include a number of former top officials to both the Trump Campaign–George Papadopoulos and Paul Manafort–as well the Trump Administration–Michael Flynn. 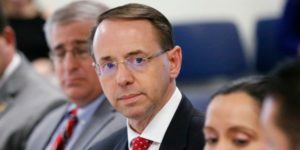 The deputy attorney general is responsible to oversee this investigation, which has prompted several members of the Freedom Caucus (a small coalition of conservative House Republicans) to talk to Rosenstein on Friday, September 28th, in a closed-door meeting “so he can explain his alleged comments on “wiring” the president.